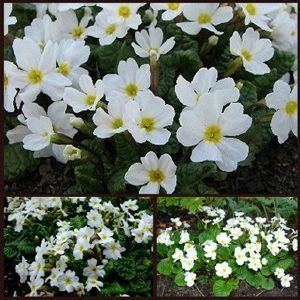 Primula ‘Snow Mound’ (Schneekissen) a delightful small variety with the purest white flowers and a delicious scent. A delightful little plant and so easy to grow. Starting to flower from mid February, this is one of the gems of the woodland garden. Not weak like some of the Primulas it is a slow and low growing perennial but very tough and reliable. Large purest white flowers with a distinct yellow eye. Ideal to grow as ground cover under deciduous trees and shrubs in any soil as long as the soil is not too dry. Our plants are divisions and not seedlings.